My “shabby chic” card was chosen as one of the two winning cards at Wee Memories! WOOT WOOT--- FNALLY! LOL. I like this card! It’s cute and not as gigantor like my cards usually are, its 5.5 x 4.25 inches. I don’t have brown CS so I dyed Kraft in to brown. The heart is hand drawn and coloured with pip squeaks (I LOVE MY CRAYOLA’s) and distressed with ColourBox velvet pigment ink. The heart’s quite shimmery, not visible in photos I know. I painted it with white pearl paint, the sparkle of pearl paint kinda matches with the sheen of the satin ribbon. This card is based on the sketch at CPS. Hope you guys like it! I do! Take out your WASHABLE markers!!! Hey everyone! I hope all of you are doing well! 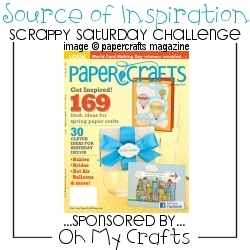 At Wee Memories the challenge is to be inspired by someone or something crafts related. For this card, my inspiration comes from all of you crafters who colour their images BEAUTIFULLY with copics and promarkers. I have the worst colouring skills and I really struggle with digi/stamp images… this time was no different. So I decided to use my regular markers and colour the image like everyone else does. I knew that regular markers will make the image bland, without any shading or depth, and it will look like I am in grade 2 all over again! So I coloured this image from Gingerloft with WASHABLE MARKERS and a water brush. It was just like painting and SO MUCH fun! Actually I have a pack of 50 markers, most of them have dried up. I have had this set since I was a kid and that was a VERY long time ago! So I scribbled my dried marker over the image and with the help of the water brush I spread the colour around. All the flowers, the two vines and the sentiment frame is cut from Silhouette. The sentiment is from LOTV. I have used holographic lilac glitter on the fairy’s wings and lower part of the dress. The unicorn’s tail, mane are glittered silver and grey. Here you can see clearly the dark patches from the marker. For all of us who don’t have Copics or Pro markers, try this out. REMEMBER, only WASHABLE markers will work. Have a great day peeps and don’t forget to check out the post before this one. Two posts in one day, I must’ve eaten something wrong! My card today is for the combined grind challenge at Play Date Cafe and CASE Study and the challenge at Wee Memories (Source of Inspiration) plus Charisma Cards (spring has sprung). Aren’t Eva Dobilas cards just amazing?! Love her work! The stamp on kraft base is Pumpkin Seed by Skipping Stone Design and the sentiment is from Schlosser Designs. The flower is a freebie this week at Silhouette store. The flourish, leaves, tiny butterflies, big butterfly, mini flowers are all cut from Silhouette. I have added diamantes as flower centres and fillers along the flourish for the much needed bling! The ribbon you see is red velvet ribbon. Added some faux stitching to frame up the middle panel. That’s it! My next post will probably be the guest designer post for Gingerloft. See you then! Have a great day peeps! I don’t have a card for you today. I do however have a freebie. I am just posting today because I wanted to tell you guys (those who don’t know yet) about the blog Feline Playful. 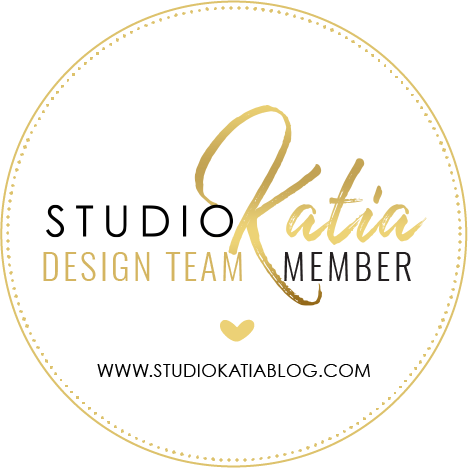 Feline Playful consists of a bunch of ladies who post Challenges (including challenge themes and #of times you can enter), Blog candies, Blog hops, DT calls and even the challenge WINNERS! They don’t get anything to do this, but still do it for YOU. How great is this?! How cool are these ladies?! I have recently joined their team and let me tell you this… what they do, it is NOT EASY. The blog is updated daily, several times a day! Now what are you doing here! GO visit this blog and take a look around. Do you want Copics? Big Shot? Pro Markers? Cuttlebug? I see your eyes getting all big LOL!!! You will find all this in the blog candies section! I have one request. To make this easier for them and for me too, if you are posting a blog candy, challenge, DT call, blog hop or come across one. Just shoot an email to us or if it’s easier for you just mail it to me. I got this idea from a very helpful person who saw the feline badge on my sidebar and emailed me a couple of challenge sites to add to the list. Thank you so much for your time peeps! This is for the Feline Playful team! First things first! I am adding all of you, who comment on a regular basis, to my Blog Roll as my blog feed is FULL and I don’t get all the updates. This is the reason I have not visited your blogs to comment. By adding your blog on my blog roll I will be able to comment as soon as I see a new post. The card that I have to show you today is BEAUTIFUL! The picture doesn’t do justice to what it actually looks like IRL. 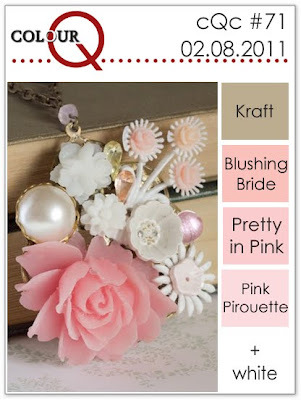 It is based on the colour palette at Play Date Cafe & Colour Q plus the CASE Study Challenge #26. This, my friends, is a Valentine’s Day card without hearts or “I love yous” (Plenty of “I love yous” inside I tell ya!). Lots going on, I know… where do I start from..hmm.. I have used quite a bit of off-white pearl paint on this one. Pearl paint on the flowers, the brown frame, the doily thingy, the kraft base and on the butterfly (lil bit on the pink layer too,which is just a printer paper)! I have used my dried up marker on the ribbon as it was looking way too clean and pretty before LOL. The sentiment is from LOTV. (won this in one of their weekly candy draws). Ooh you can see the shimmery goodness in this pic a little more clearly. I have added pink net and gold threads in place of the panel that was in the CASE Study card. Can you see the beads? Here ya go, a clearer view. The blingy, sequined flower,behind the bow, is part of a ribbon. I wanted to add shimmer and bling because of the silvery goodness in the PDCC colour palette image. Reminds me of silver jewellery. By the way, the pattern paper is embossed (love the embossing folder) and inked heavily to give it a pink tint. The pigment inks that I have used here are Old rose, velvet and dusty plum plus a bit of Sepia black. I have tied a few tiny pearl beads along the vertical gold threads. You can’t see them so clearly in the picture but they look gorgeous! Oh I SO want to show this to you in person!!!! Have a GREAT day!! Don’t forget to check my “Simpler” cards (the last two posts, before this one). The card that I have to show you today is based on the sketch at Skipping Stones Design and I have used Pumpkin Seeds Sentiments set that I won in one of their challenges. This set is up for grabs this week so DO PLAY! I have rotated the sketch 90 degrees counter clockwise. The smudged and bleeding ink look was done intentionally. This stamp set is a bit grungy, this is why I thought to go with grungy hearts. This too is a simple card (I am having fun making these!). 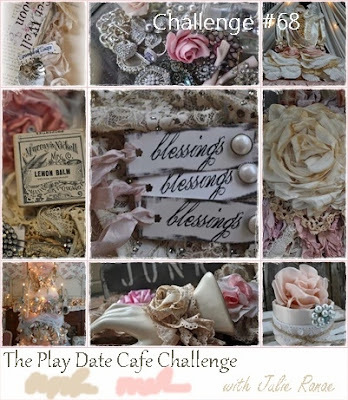 Do check my blog back tomorrow for my Play Date Cafe card… I LOVE IT! I just hope the picture comes out OK. I am having a good week (touch wood). A few of my cards got honorary mentions, top threes and a fab four! And here is today's simple love card based on the CPS #204 sketch. I will be trying my hand on these simpler cards for a change. I wanted to add stitching on the off white panel here but decided not to and let it be. The sketch is so fun! You can do as little as I have done and keep it clean or frame it up with flowers like I usually do :p Hope you guys like my “simple” take on it! Ran the embossing folder twice, first covering the upper half and then the lower half… the folder line/crease is pretty visible on the left side… I glued pearls on both sides to hide the folder line. The rose is hand made and the lil daisies are punched. Alrighty then! Catch you guys soon! Thanks for stopping by! P.S: I really want to thank those of you who take time out to comment… It brightens my day when I see “X Comments”, whenever I visit my dashboard.